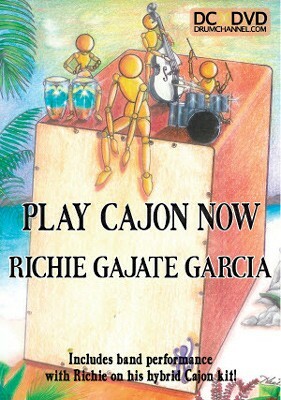 Play Cajon Now Richie Gajate Garcia DVD – With the basic exercises in this DVD, you’ll learn to play the cajon and make it sound like a drum set as you master contemporary rock and Latin beats. You will also learn how to add other percussion with your hands and feet. Richie is a master and innovator of the Cajon. He has developed what he calls his hybrid kitùa unique drum-percussion set-up that revolves around the Cajon. In the amazing performances on this DVD, Richie truly sounds like three drummers. Whether you play on your own, with friends, or in a band, Richie will educate and inspire you as he teaches you all about playing the cajon. Running time: 82 minutes. **Please note: Opened media is non-returnable.